In my constant quest for items on sale, I found this Zara jacket for a major discount. I was silently stalking this number for a while and I was so thrilled to find it not only on sale, but in my size. The fit is lovely and the thickness is surprisingly thicker than what I expected. I normally don't go for items that have an Asian theme for fear it might not look as modern on me as it does on others, but the bomber/baseball style made that concern moot. I wore this outfit to meet up with the fab Sarah from The Weekend Diaries who also offered to take my photos. I never really know what to expect from maintaining a blog but I have loved the networking the most. Thanks, Sarah for the photos and for being so much fun to hang out with! The jacket is fabulous! Love all the details. We should meet up again and I can help you analyze your traffic data and stuff! I love the jacket and the mint stachel. Such a cute outfit! I love when an item I've been lusting over goes on sale! It's such an exciting day when you finally won't feel guilty for spending a little bit more! I love the jacket and how you wore it! I love the back of your jacket! Such a pretty outfit! 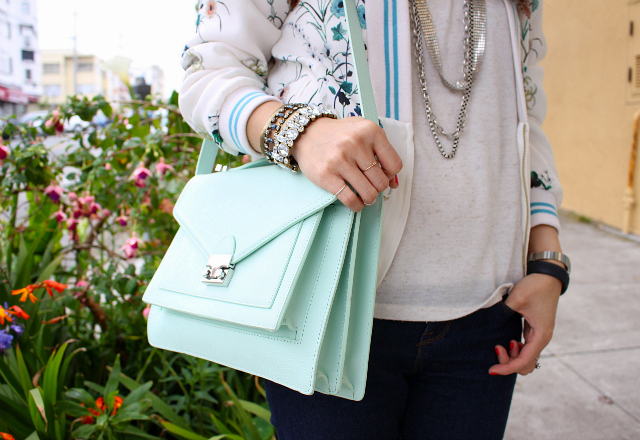 Such a cute jacket and I love that bag! What a cool jacket! That bag is pretty too! oh dear, this jacket was a really good bargain! That suits you so well and the bag is perfect for this look and very cute! I am obsessed obsessed obsessed with your bag. omg! When an item I've been "stalking" goes on sale, I get so excited. That jacket is pretty great, & so is the bag. I love that minty color. Great jacket Nancy! I love the design. Glad it was on sale and in your size. It was meant for you. Love your bag! She took some great pictures. that is a great jacket and the pics came out great! What a gorgeous jacket...love the vintage vibe to it. I feel the same way about wearing Asian inspired clothing - I feel it may be too much like acostume. 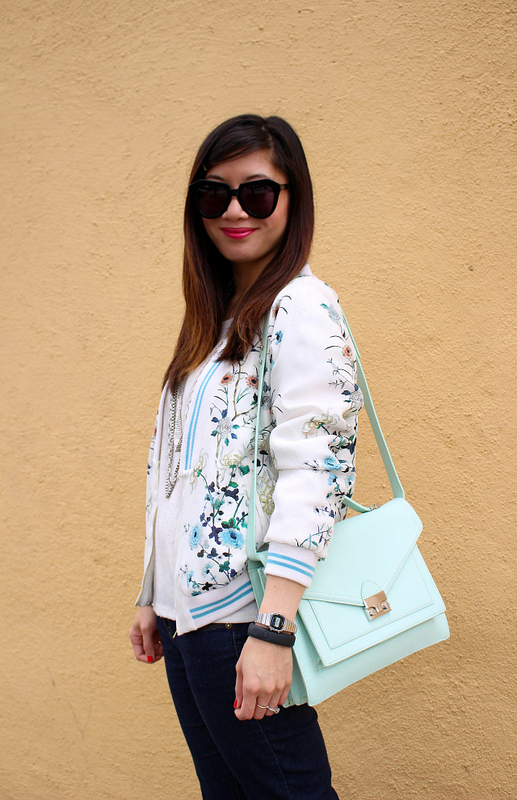 That Zara jacket is beautiful and I love how you styled it! Also, the handbag is cute. that is such a fun jacket! Gasp! That jacket is stunning!! So glad you got it on sale! Good work! The pics do look great! 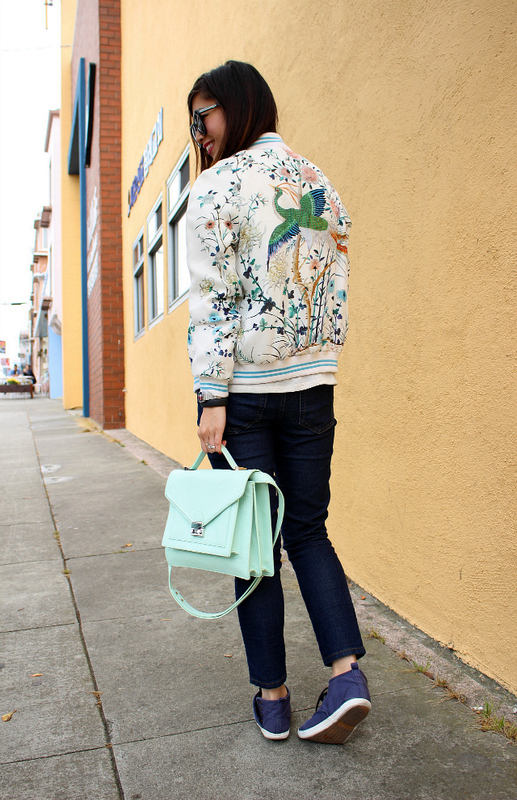 Such a gorgeous, fun jacket! I love this casual look. 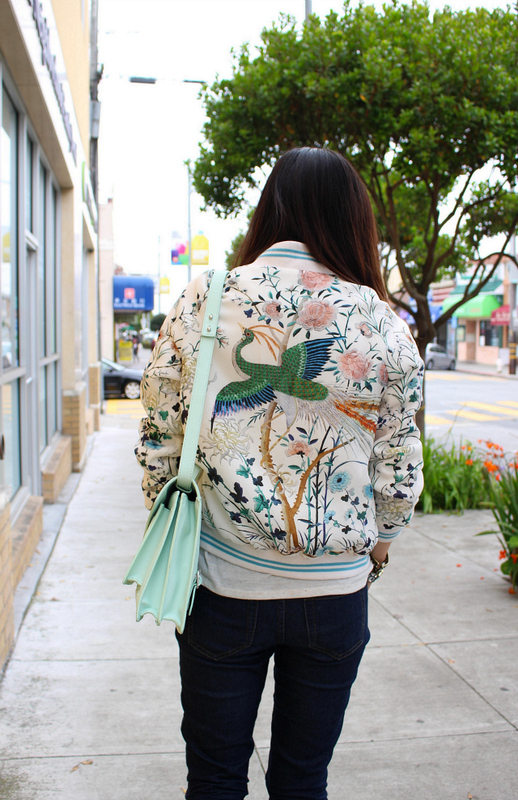 You certainly got soooooo darn lucky with this jacket with its mix of soft & tough elements....the dainty Asian prints vs. the bomber shape is just awesome! I love this outfit. That jacket is wonderful!